THE LLEWELLYN CHOIR HONOURS ANZAC. 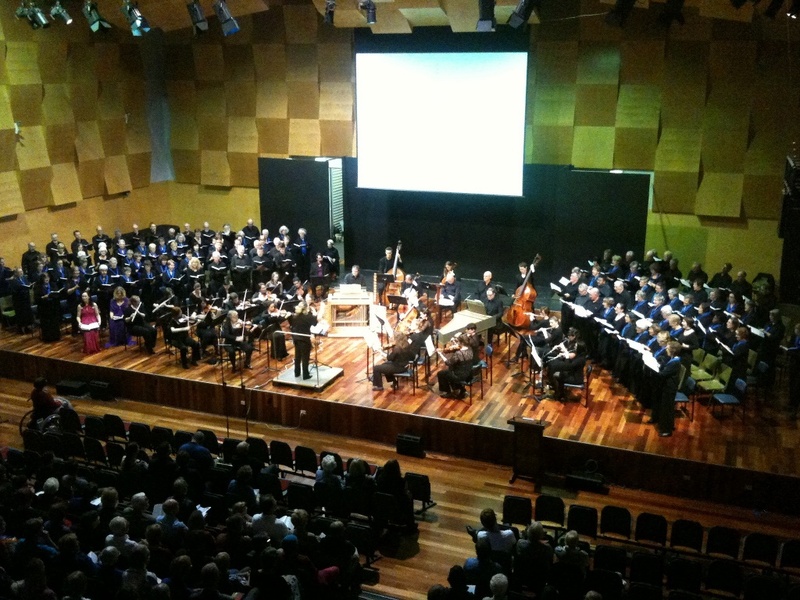 In a beautiful tribute to ANZAC, The Llewellyn Choir under the skilled direction of Rowan Harvey-Martin, presented The Kathryn Holmes and Mary Reid Memorial Concert as the second Yass Music Club concert for 2015. Their program included works by Vaughan Williams, Arthur Bliss, Martin Shaw, Ivor Gurney, Adolphe Adam and Ernest Farrar with several of the pieces written during the First World War actually involving men who were in the fighting at the Dardanelles as well as on the Western Front. The immediacy of their wartime experiences gave the performance a deep pathos and the pieces became a stunning affirmation of the bravery and sacrifice involved and added an appropriate gravitus. The Three Trench Songs, ‘It’s a Long Way to Tipperary’, ‘I want to go home’ and ‘There’s a long trail a-winding’ gave a slightly lighter touch to the program and were almost an opportunity for the audience to sing along after the solemnity of the remainder. The final piece the choir sang was ‘Anzac Cove’ by a modern Australian composer, Wendy Hiscocks, as a particularly moving setting of the words of the Turkish commander, Mustapha Kemal Ataturk, writing of those who’d been killed and buried in a foreign country and promising that the fallen soldiers would be “our sons as well’. These words remind us that our soldiers were, in fact, an invading force and the Turks were bravely defending their own country. The tone of the concert was sombre as is fitting for such a tribute where reverence and respect should be the overriding moods. The Club took the opportunity to welcome members of the Holmes family as well as farewelling its President, Brian Johnson and a presentation was made to Brian by Peter Crisp in appreciation of the fine leadership that he has given. Brian and his wife, Nancy, will be sorely missed and we wish them well. The usual delicious supper was prepared by the Hospital Auxiliary and mention was made of several Dr RAG Holmes Scholars from the Giddy family, who will be performing at the Westminster Presbyterian Church in Cook on Saturday, 2nd May at 2.00pm. Mention was also made of the next Music Club concert for Sunday,14th June at 2.00pm and which will be presented by Bush Baroque of Bywong. It should be a stunning concert of gracious music played on a wide variety of ancient instruments. Further details of the Music Club can be found at its web page http://www.yassmusicclub.com or by phoning Brian on 62263514. The Llewellyn Choir was founded in 1980 and is recognised as one of Canberra’s leading amateur choral groups. Under the baton of current Musical Director Rowan Harvey-Martin with Répétiteur Anthony Smith, they have given critically acclaimed performances. 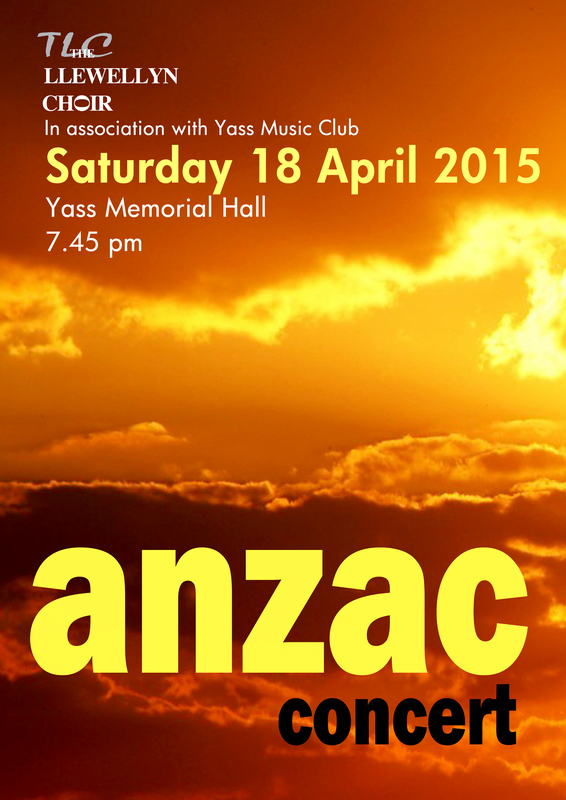 Their performance in Yass will focus on the centenary of World War 1 and include music from that time in anticipation of ANZAC Day on the 25th April.